With the addition of the new Columbia River Gorge Express cyclists now have a new way of getting to the gorge to enjoy the beautiful trails, including the reopening of sections of the Historic Highway as bike and footpaths in September. 2016 is a huge year for the Columbia River Gorge. 100 years ago Oregon celebrated the opening of Route 30 — the Columbia River Highway — and this year we’ll celebrate its grand re-opening as a State Trail with miles of new biking and walking-only paths that open up exciting carfreeexploration opportunities. But even as new pieces of the State Trail are completed, our overuse of cars is killing the Gorge vibe. 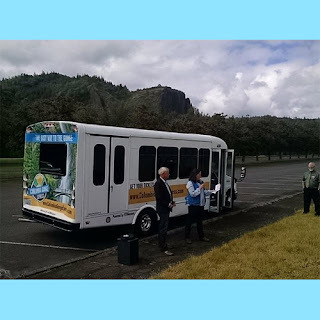 In an effort to reduce automobiling’s impacts to this historic natural resource we all share, the Oregon Department of Transportation has launched a new public transit line. The Columbia Gorge Express opens next Friday. The new line will have 12 departures a day Friday through Sunday from the Gateway Transit Center with stops in Rooster Rock State Park (25 miles east of Portland) and Multnomah Falls (30 miles east of Portland). It’s just $5 for a round-trip ticket and bicycle riders are welcome aboard: Each transit vehicle has capacity for three bikes on the rack.